Diese Website verwendet Cookies, um bestmögliche Funktionalität bieten zu können. Weitere Informationen zu Cookies erhalten Sie in unserer Datenschutzerklärung. Die Uniklinik Köln steht rund um die Uhr für die Versorgung von Notfallpatienten zur Verfügung. The University of Cologne is offering the following scholarships to its DFG-funded Cologne Cardiovascular Research Center (CCRC) Graduate Program “Inflammatory and Cellular Stress Signaling: Switches to Vascular Dysfunction” for highly qualified and outstanding master and medical students. The objective of the offered undergraduate scholarships is to integrate highly qualified and outstanding medical students and master students of natural sciences into ongoing CCRC research projects. International guest students are more than welcome to join the graduate program and spend a research period in Germany. The University of Cologne strives to increase the share of women in the University and hence also strongly encourages women to apply. Applicants with disabilities who are equally qualified will be favored. For additional information, please contact our CCRC coordinator Dr. Monika Schlosser by e-mail (monika.schlosser@uk-koeln.de). Please provide your CV and half a short statement explaining your motivation to apply for the scholarships in Cologne Cardiovascular Research Center (maximal 1 page). Arterial vascular disease has long been considered as a state of adverse structural remodeling within arteries upon accumulation of circulating and vessel wall-derived cells, matrix, and cholesterol – histological hallmarks of atherosclerosis. However, more subtle alterations of vascular homogeneity and in particular vascular stressors have emerged as critical pre-requisites and drivers for a large spectrum of diseases. The major aim of our collaborative research training group (RTG) is to identify common vascular stressors and overlapping or redundant cellular signaling responses across a broad range of vascular disease entities. Our RTG welcomes highly motivated PhD and MD students to actively pursue cutting-edge research on individual, yet coordinated research projects, that are directly related to answering pertaining key questions for specific diseases in this research field. This RTG, embedded into the Cologne Cardiovascular Research Center (CCRC) aims to educate the next generation of cardiovascular researchers and to foster better understanding of the translational needs in this important medical area. 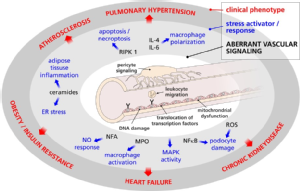 Figure 3.1 Abberant cellular signaling and stress activators / responses in VASCULAR DYSFUNCTION, and their role in distinct clinical phenotypes. Illustration of the main focus of research projects on mechanistic insights (projects D, H, I) and/or disease-oriented models (projects A, B, C, E, F, G), creating multiple opportunities for collaborations within the CCRC-RTG, and enabling the identification of redundant mechanisms as well as multi-facetted basic research training for PhD/MD students. The overarching aim of this interdisciplinary and collaborative research initiative is to unravel common underlying mechanisms linking inflammatory stressors and cell signaling responses in arterial vascular disease. The identification of critical and redundant stressors as well as pertaining cellular signaling pathways that propagate dysintegrity of the arterial bed should be a prelude to revealing potential therapeutic targets for a wide range of different vascular diseases (Figure 3.1). In this context, we will also consider mechanisms of inflammatory resolution. 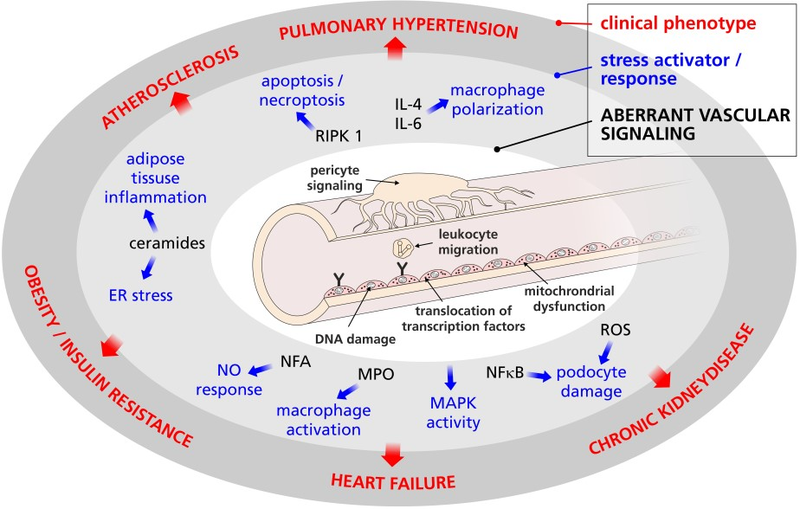 Since vascular dysfunction leads to a broad range of diseases and conditions, the expected gain of newly found knowledge and increased understanding should ultimately translate into the development of novel interventions, such as preventive paradigms, as well as new therapeutic options to treat vascular dysfunction in various organ systems and heart, lung and kidney in particular.